Blake Lueders (right), who is from Zionsville, Indiana, returns to the midwest as the Card prepare to take on the Fighting Irish. Lueders has nine tackles and two TFL this season. A false whistle from the stands. A hotly contested goal-line call to end the game. The 2012 Notre Dame-Stanford game had it all in terms of drama and controversy, and on Saturday, Stanford will get its shot to go into South Bend and avenge that tough loss of two seasons ago. “As a football coach, you always move on, but you have a box that you keep games like that in,” said head coach David Shaw. To rub salt in the wound, Hogan recalled that the flight home actually had the game playing as in-flight entertainment, something that certainly hurt and depressed an already frustrated and defeated team, but also gave it the extra jolt and push it needed to win out through a tough schedule and roll to a Rose Bowl victory. That being said, for players like Blake Lueders, who hails from Indiana, and Hogan, who has close ties to Notre Dame, the opportunity to play close to home is not just an opportunity for redemption, but also a return to a site that has always been meaningful to them, making this game all the more special. However, in order to come away from Notre Dame with another win that could give the program significant momentum moving into the meat of a tough conference schedule, the Cardinal will need to patch up the roughness around the edges of the offense that has caused Stanford to stumble, not roll, into South Bend on Saturday. According to Shaw, Stanford has the three elements that constitute a successful red zone offense in his mind: efficient running backs, an athletic quarterback and big, strong receivers that can win battles for the ball. 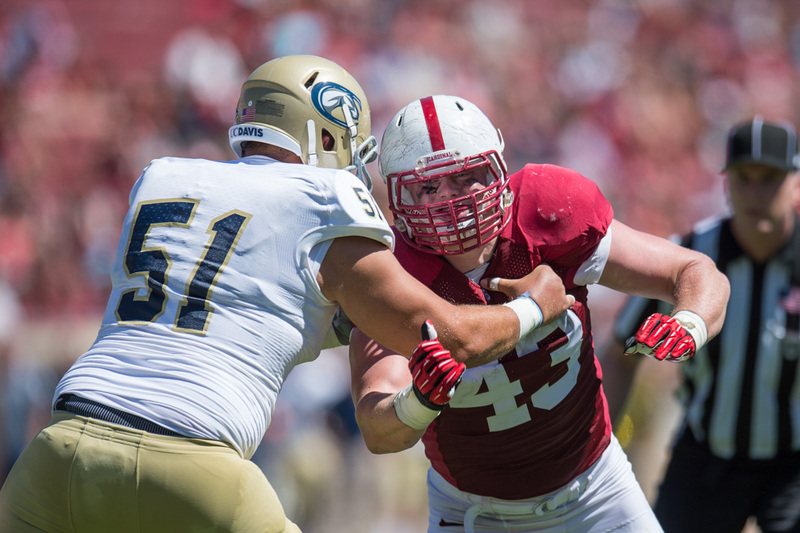 The only problem has been something that has traditionally been a strong point for Stanford teams: turnovers and penalties. But this has been evident, really, since three weeks ago after the loss to USC. Since then, Shaw has emphasized every week that the team has been working on ball protection and discipline amidst noise. But are those problems something that coaching can fix? Even though the penalties and turnovers kept setting Stanford back against both USC and Washington, Hogan believes that those struggles are not all that has defined this offense and that the unit is trying not to let the negatives get to them. “I don’t think that we felt discouraged at all at any point in the game going down there,” Hogan said. It is no secret that Stanford wants to get the ball in the hands of Ty Montgomery, its premier playmaker, as often as possible to expand the offense’s success, but the fact that everybody knows that that is what Stanford has been trying to do has certainly limited those opportunities. That being said, Shaw has also been trying to get the ball to his other playmakers, particularly junior receiver Michael Rector, but the opportunities have just not arisen. In Tuesday’s press conference, Shaw also touched on two issues of national significance that revealed themselves over the course of the last week: concussions and the NFL coaching ranks. Michigan head coach Brady Hoke was widely criticized for his mishandling of quarterback Shane Morris, who showed visible signs of a concussion and was stumbling around the field, but was allowed by Hoke to remain in the game. Hoke would later go on to state that he did not realize that anything had been wrong with his quarterback. Shaw emphasized a much more cautious approach in which everybody keeps an eye on players on the field and players are pulled from the game if there is even a question of a concussion, citing his own experiences with former Cardinal receiver Chris Owusu ’12, who had problems with several concussions when he played for Stanford. Shaw’s name has also been drifted as a possible suitor for the now-vacant Oakland Raiders head coaching position, but the Stanford head coach is adamant that he is still staying put for the foreseeable future and has not been in contact at all with the Raiders’ organization regardless of his ties to the team as its former quarterbacks coach.